Five national leaders in the fight against hunger and poverty offer their perspectives on the SNAP debate and what we need to do to fight back. Last week I posted about “Congressional Hunger Games”—the games both parties are currently playing with the lives of the one in seven Americans who currently receive food assistance. While House Republicans are clearly the most reckless with their attacks on SNAP (food stamps), most Democrats have also failed to speak out to protect the program, and worse, have helped pave the way for cuts. Because I feel somewhat at a loss as to how to turn this tide—what we should be doing to ensure that our elected representatives aren’t so cavalier in their disregard for the experiences of so many Americans—I decided to check in with some people who have devoted their lives to fighting hunger and poverty. I asked them for some perspective on where we are, and ideas for what we need to be doing right now as the SNAP debate continues. With one in seven people on SNAP (food stamps) in this country, and 80 percent of SNAP families working, the recent debacle of passing a farm bill without a provision for SNAP shows that House leaders and their cheering squad are completely out of touch with the reality of Americans. If you or someone you know have received SNAP benefits, please call your senators and representative and tell them how important the program is to you and your family’s health, sanity and sense of peace in the world. Say it loudly, clearly and briefly, and, if your children are whining and crying in the background—that’s fine too—maybe it will remind our legislators that 50 percent of the people receiving SNAP assistance are children. Also, those who care about this program need to know that it will take about 100 SNAP participants in a single district to counteract the voice of one corporate lobby. Shame them and embarrass them into better action, right decision making and tell them to stop wasting away your tax dollars on subsidies for wealthy agribusiness interests rather than investing in the health and well-being of America’s children. Finally, send your legislators an exam about the facts of the Farm Bill and SNAP. Ask questions about the economic impact of cutting the program—how much economic activity is created by every $5 in SNAP spending? (Answer: $9). Ask simple, elementary questions about the characteristics of SNAP recipients. Ask questions such as, How many people in your district receive SNAP? How much in SNAP benefits is spent in grocery stores in your district? Score your legislators on the test and publish the results. Remember, they seem to think that passing a Farm Bill with only 20 percent of its content—leaving out 80 percent which includes the nutrition provision—is satisfactory. Remind them that answering only 20 percent of the questions is a failing grade, not a pass. Thus far, the debate surrounding SNAP in Congress has shut out the voices of people who participate in the program, and has been lacking attention to the facts about SNAP and hunger. 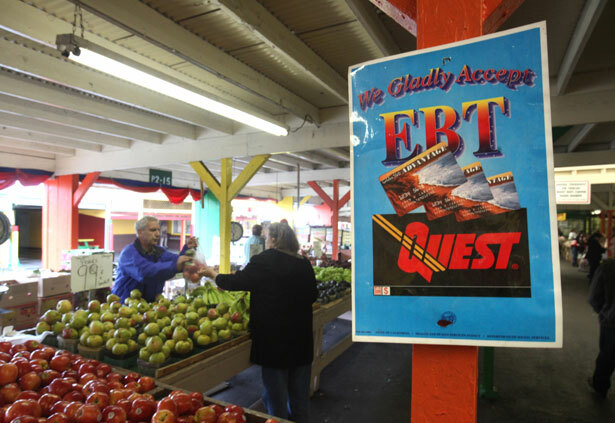 Why are there 47 million people receiving food stamps today? You’d think the answer is simple. No matter what the economists say, the recession is still all too real for millions of people who are still unemployed or can only find part-time work or have found a low-paying job to replace the higher-paid job they had before. From the 6 million people at the bottom whose only income is from food stamps on up to the far larger number whose income is not enough to live on, food stamps make an indispensable difference. But, not so fast. That answer only works if you’re interested in the facts, which the Republicans are not. They did it again for the umpteenth time with their farm bill trick the other day. Another fact. Before the recession there were 26 million people receiving food stamps. Now there are 47 million. Did 21 million people decide to become moochers? Again, you’d think the answer is simple. The answer is simple in Tea Party–land too. It’s just totally wrong. I went to Mississippi with Robert Kennedy in 1967 and saw children so malnourished they had swollen bellies and running sores on their arms and legs. We went to Eastern Kentucky in March 1968 and again saw visible evidence of serious malnutrition. Senators Ernest Hollings and Herman Talmadge then went on their own in their home states of South Carolina and Georgia and were shocked by what they saw. We’ve come a long way. We have way too much poverty and plenty of food insecurity but we don’t have Calcutta-like malnutrition any more. That’s because of food stamps. And food stamps are the powerful program they are because there was a bipartisan coalition that supported the program. Richard Nixon was the first president to send a presidential message to Congress about hunger in America. Bob Dole was a champion of food stamps. George W. Bush asked Congress for and got Congress to enact a reauthorization of food stamps that expanded the program. Until now. Now we have a Republican party that wants to destroy the program if it can. For shame! So listen up. All we have on our side is people power and that’s what’s needed now. This is a dangerous time. The most vulnerable people in our nation are in serious jeopardy. All of us who care about preventing hunger in the United States need to act now and tell our senators and members of the House that we need to save food stamps and keep it intact. The House’s action in passing a Farm Bill that includes massive corporate subsidies but not SNAP benefits (formerly known as food stamps) for the first time since 1973, was labeled “one of the most brutal” of recent congressional sessions by The New York Times editorial page. While responsibility belongs with the House leadership, we have sadly created a national climate and culture that for too long has tolerated if not acquiesced in gross negligence towards children, especially those most vulnerable and voiceless. And for that, responsibility is more widespread. For years child poverty has increased. With few exceptions there has been little more than lip service, on the part of elected officials and our national leaders. The Annie E. Casey Foundation’s just-released Kids Count report shows that the US child poverty rate is 23 percent with 16.4 million children below the poverty line, up from 22 percent in 2010 and from 19 percent in 2005. The poverty rate for children under 3 is even higher: 26 percent. The number of children in poverty increased even as the unemployment rate gradually declined. From 2007 through 2011, 12 percent of children lived in high-poverty areas nationwide, a total of 8.6 million, up 2.3 million children since 2000, when the rate was 9 percent. It’s not enough to wait and then decry the egregious actions of a House majority setting up the SNAP program for savage cuts. They are simply exploiting an opportunity that both parties have allowed to ripen. But the silence and inaction is less a reflection of the strengths and weaknesses of any particular political leaders, and more an indictment of the now pervasive political culture both major parties have conspired to create. It’s a culture that regards advocating for those outside the politically sacred middle class to be a sign of naiveté and weakness. It shuns even a whisper of sacrifice for others, with no appetite for giving voice to the marginalized or voiceless. Let’s hope the silver lining in the House’s extremism will be to spark the national courage and commitment needed to finally stand up for kids—not just for the nutritional assistance they desperately need, but for concerted effort necessary to end child poverty. Elie Wiesel once wrote that “what hurts the victim most is not the cruelty of the oppressor, but the silence of the bystander.” In that sense responsibility for the plight of America’s poorest children goes beyond political extremists in one wing of one party. We all need to do some soul-searching. The terrible House action on SNAP has led to widespread outrage from the public and the media, but we need to grow that outrage. We have to keep a clear message opposing all SNAP cuts. We need to keep telling the story of how important SNAP is, and to whom. That is more complicated since too much of the SNAP debate has been based on misstatements about the program and its participants—sometimes the misstatements are deliberate, sometimes they are just based on outdated conventional wisdom. They come not just from politicians and media openly hostile to SNAP but also, too often, from the mainstream media. Indeed, as one example, Tennessee Representative Stephen Fincher, one of the most outspoken anti-SNAP members on the House Agriculture Committee, lives in a very rural county where 22 percent of the people receive SNAP. The failure of the media and members of Congress to articulate this reality and make it part of the narrative of why SNAP is crucial in every congressional district leaves too many rural legislators and opinion leaders feeling free to ignore the needs of their low-income constituents and neighbors. Here’s another place the debate has gone off the rails: claims that the rapid growth of the number of SNAP participants means that the program is “out of control.” The evidence is overwhelming that the caseload growth has simply tracked the economy. The government’s U-6 unemployment rate is a better measure of economic pain than the official “unemployment rate.” It includes people who want full-time work but are only able to find part-time work, and those who aren’t looking for work because they are so discouraged. In June, the official unemployment rate was 7.6 percent, but the U-6 rate was 14.3 percent. The SNAP participation growth and U-6 growth graphs of the last few years look very much alike. And every indication is that, even as the economy slowly recovers from the recession, tens of millions of workers still will be struggling with low wages, involuntary part-time work and general job insecurity. A strong SNAP program is a crucial support. Our job is to make more people know about the attacks on SNAP, and the importance of SNAP to America’s children, seniors and working families. Seven out of ten voters oppose cutting SNAP. They need to know who SNAP’s opponents are and what they want to do. And our job is to channel the outrage into more and louder voices to Congress and the media about the real facts about SNAP and the harm that SNAP cuts will do. As your post points out, the Supplemental Nutrition Assistance Program, a k a SNAP or food stamps, is one of our most successful anti-poverty initiatives. It helps babies and toddlers grow and learn; it help families to be less dependent on public benefits later on; it helps the economy by increasing spending in food stores across the nation. And yet, both the Senate and House have been willing to cut SNAP. The Senate, led by Agriculture Committee Chair Debbie Stabenow (D-MI), has been willing to reduce benefits by $90 a month for households, cutting SNAP spending by more than $4 billion over ten years. The House has been willing to cut SNAP far more deeply. Their original farm bill cut SNAP by $20 billion over ten years, and the proposed House budget cut $130 billion over ten years, by turning SNAP into a fixed amount granted to states, with no flexibility to rise when the economy tanks. These cuts, which would deny some or all benefits to millions of people, allow us to see congressional hypocrisy on parade. Case in point: Representative Stephen Fincher (R-TN), speaking in Memphis after the vote, said, “The role of citizens, of Christians, of humanity is to take care of each other, but not for Washington to steal from those in the country and give to others in the country.” The Environmental Working Group, however, has identified Representative Fincher as receiving more than $70,000 in direct farm subsidy payments in 2012, and $3.48 million from 1999 to 2012. So get mad—but don’t lose hope. When the House split off the nutrition provision—including food stamps—from the farm supports (and made the largesse to agribusiness bigger and permanent), it wasn’t because the House majority wants to end SNAP. It was because they didn’t have the votes to pass the farm bill with the SNAP proposal they had developed. True—some wanted to cut more; others wanted to cut it less. And now that the nutrition provisions are out, the House leadership is in a jam. Some who care about continued farm subsidies do not want to pass a separate nutrition bill with very deep SNAP cuts, because they fear they will then be unable to put together the votes needed to pass a farm bill. Right now it is unclear whether the House leadership will be able to come up with a separate nutrition bill that won’t blow up agricultural interests’ hope of getting a farm supports law passed. With the president and the Senate leadership firm in rejecting a bill without a nutrition provision, advocates have leverage. In part, that leverage comes from the all-important legal status of SNAP: it is a permanently authorized program, which means it will continue to operate as is if Congress doesn’t pass legislation to change it. That is not true of the farm support programs—they revert to old and far-less generous subsidies if Congress doesn’t pass a new farm bill by September 30 or temporarily extend current law. That makes it possible—and necessary—to say NO: cuts to SNAP are unacceptable and wrong-headed and must be rejected. It may mean they can’t pass a farm bill. Well—if Congress wants a farm bill, they’ll have to reach out to members of Congress who are strong supporters of SNAP, and win them over by leaving SNAP alone. For this to work, we have to open our mouths. The nation’s most vital nutrition program is too important to be quiet about, or to think other people will speak up loudly enough without your voice joining in. Congressional supporters of SNAP have to hear from us, so they’ll have the oomph to fight harder. Opponents of SNAP have to be held accountable, to see there is a cost to making vulnerable people hungrier. You can find background info at the Food Research and Action Center. What impact has the sequester had on low-income housing?